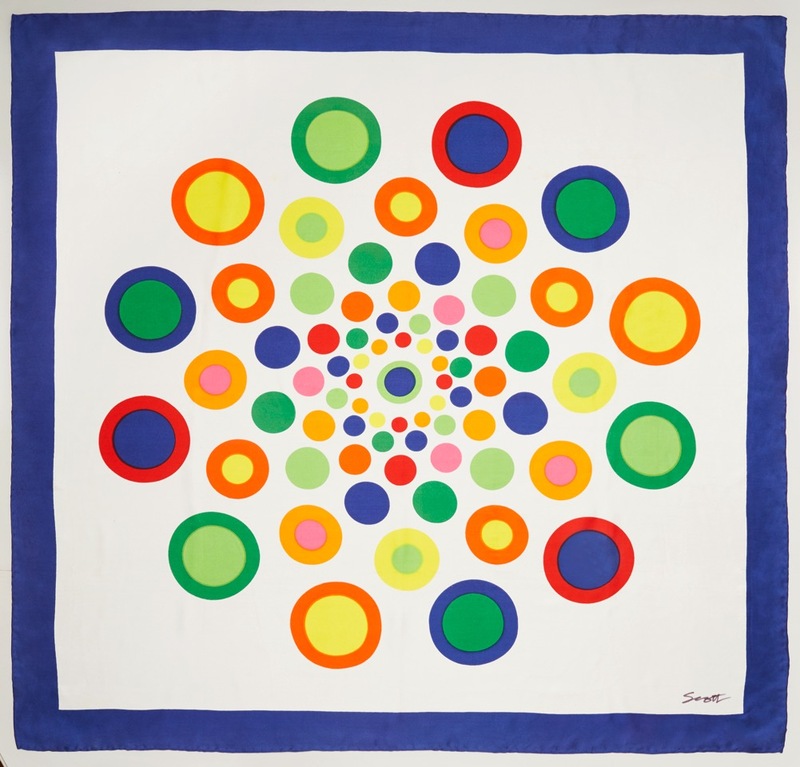 The COLOUR Scarf by Patrick Scott was originally commissioned in 1968 by Kilkenny Design Workshops, exactly 50 years ago. KDW were a government-funded research and development centre of excellence for design established in 1963. It was created to inspire, support and demonstrate to industry how design could be the key factor in change and lead to economic success. Patrick Scott was made a director of KDW early in its existence, and despite trying to leave the board many times, he was persuaded to stay for 25 years. His love of craft and his commitment to high design standards made his input invaluable. This rare scarf design was one a few commissions by KDW of Pat’s work but never went into production and was subsequently archived by Pat at the time. It was only in 2017 that the scarf was rediscovered and was, as such, the inspiration to collate Pat’s significant body of work in rich graphic colour and design for exhibition at Doswell Gallery, Roscarbary, Co Cork which opened 24th August 2018. 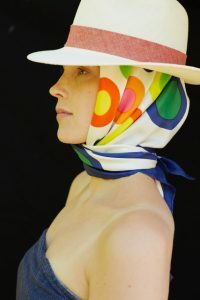 100% Pure Silk Satin Scarf, 85cm x 85 cm designed and signed by Patrick Scott. Reproduced exclusively by STABLE of Ireland. Patrick Scott, one of Ireland’s leading visual artists is a major figure on the international art stage. He died in 2014 at the age of 93. Colour by Patrick Scott 1968, is part of the STABLE ART Series Project and follow “Pub Wall” by Patrick Scott and “Flight” by Louis Le Brocquy, crepe de chine silk scarves reproduced exclusively by STABLE of Ireland.